Nowadays, finding an actual newsstand is next to impossible. Tap Mode’s News Addict attempts to fill that need by creating a virtual newsstand experience. 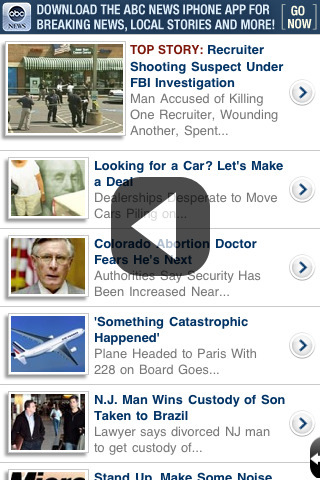 This little app gives users all their favorite news sources in one convenient location. It works like bookmarks to major news sources–with a single click, users are instantly redirected to their news of choice. No need to scroll through different websites. No need to look through bookmarks. And best of all, no need to fiddle with the tiny web browser on the iPhone. Special features on the app include tilt-scrolling and auto-hide toolbar. Users can calibrate their phones to tilt scroll by holding their iPhone in a good reading position and clicking the “calibrate” button”. With this app, users can access articles from over 41 sources, including the NY Times, CNN, and the Wall Street Journal. News Addict also boasts 25% more screen space than iPhone’s Safari which improves the user’s browsing and reading experience. Navigating the site is child’s play. Show or hide the toolbar by pressing the small arrow in the left hand corner. Access the toolbar to go back or forward, refresh or stop a page, and access the news panel. Overall, News Addicts offers an easy browsing experience. The application loads quickly and so do the links to the news sources. The graphics are simple and reminiscent of a physical newsstand. It also helps preserve prime iPhone real estate by reducing the number of news icons on the iPhone. However, it seems like a lite version of News Feed Elite, and it could stand to make several improvements. News Addict should start off by creating an expanded news selection to include specialty magazines, local newspapers, local magazines, and overseas sources. The newspaper selection should also be customizable, and users should have the ability to delete sources they don’t like. They should also be able to move the different news icons around to maximize their experience. Having to scroll through all 41 sources to find the 5 preferred ones is annoying and a waste of time. Developers might also consider adding a feature that automatically resorts news icons based on frequency of user visits. Overall, News Addict offers a satisfying experience. And $0.99 is not a bad price, but there are better news apps out there. AppSafari review of News Addict was written by Linda Ta on March 22nd, 2010 and categorized under App Store, Feeds, Fun, Net, News, Reading. Page viewed 3873 times, 2 so far today. Need help on using these apps? Please read the Help Page.